The launch of NASA's NuSTAR space telescope, a $165 million black hole-hunting X-ray observatory, will be delayed at least one week until March 21 to give engineers extra time to complete engineering reviews of the mission's air-launched Pegasus XL rocket, the space agency announced Friday. "The mission's launch is now scheduled for no earlier than March 21 to allow the launch vehicle team an additional week to complete necessary engineering reviews," said a statement released by NASA's Jet Propulsion Laboratory. "After the reviews, the team will begin final preparations for the rocket's delivery to the launch site at Kwajalein Atoll in the South Pacific." Technicians are preparing the Orbital Sciences Corp. Pegasus XL rocket and the NuSTAR spacecraft for launch at Vandenberg Air Force Base, Calif. The rocket and its carrier airplane, an L-1011 jumbo jet, will fly from California to Kwajalein about a week before launch. 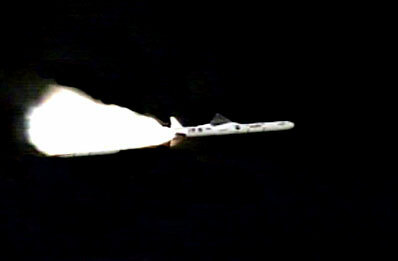 NASA did not disclose details of the engineering reviews on the Pegasus XL launcher. Engineers were attaching the NuSTAR spacecraft to the Pegasus rocket Friday, according to JPL. The air-launched satellite booster has flown 40 times, and next month's flight will mark the 25th mission of the Pegasus XL configuration, which features more powerful rocket motors than earlier versions. The L-1011 airplane will take off from an airstrip at Kwajalein and drop the Pegasus rocket at an altitude of about 39,000 feet, then the winged launcher will ignite and climb to space. The 51,000-pound booster, powered by three solid rocket stages, will deploy NuSTAR in an equatorial orbit more than 340 miles high. The nearly 800-pound satellite will unfurl a 33-foot boom with X-ray optics a week later and begin its science mission in late April, if launch occurs March 21. 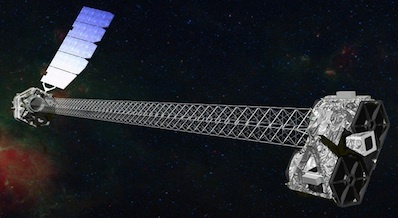 NuSTAR stands for the Nuclear Spectroscopic Telescope Array. The mission will explore the high-energy X-ray universe for two years, probing the supermassive black hole at the center of the Milky Way galaxy, surveying for collapsed dead stars, and studying the exchange of heat between the sun and its million-degree atmosphere.